When I checked out the colours for the Utah Divas Colour Challenge, I have to admit, I thought the addition of Marina Mist to an otherwise "bright" colour palette was a little odd. I usually stick with one colour family when designing cards, but I had to make it work! I created my own Pacific Point "Designer Series Paper", because (can you believe it?) other than the paper stacks, there isn't a single DSP that has Pacific Point in it! I used the Gorgeous Grunge Set to create the DSP. Pretty cool, eh? The coffee cup was stamped in Early Espresso and I added a Marina Mist "sleeve" to it. 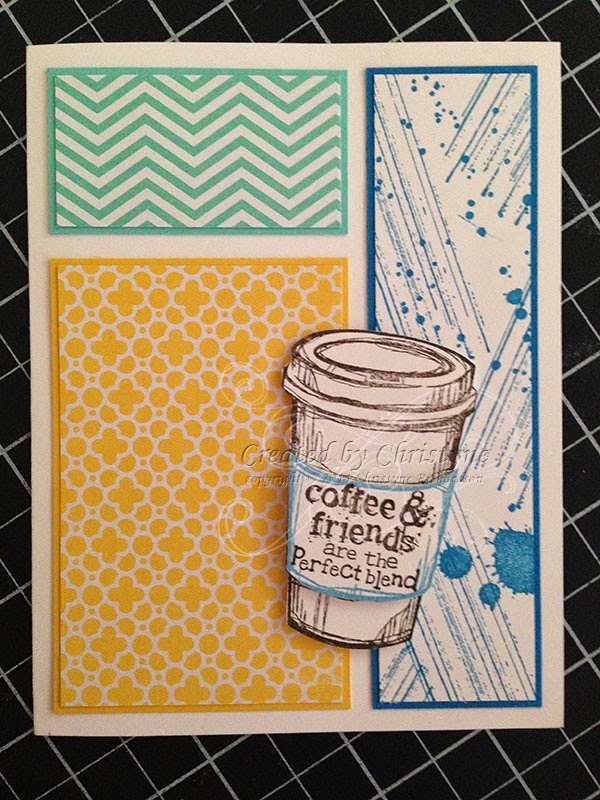 And of course, I used a LOT of Stampin' Dimensionals. 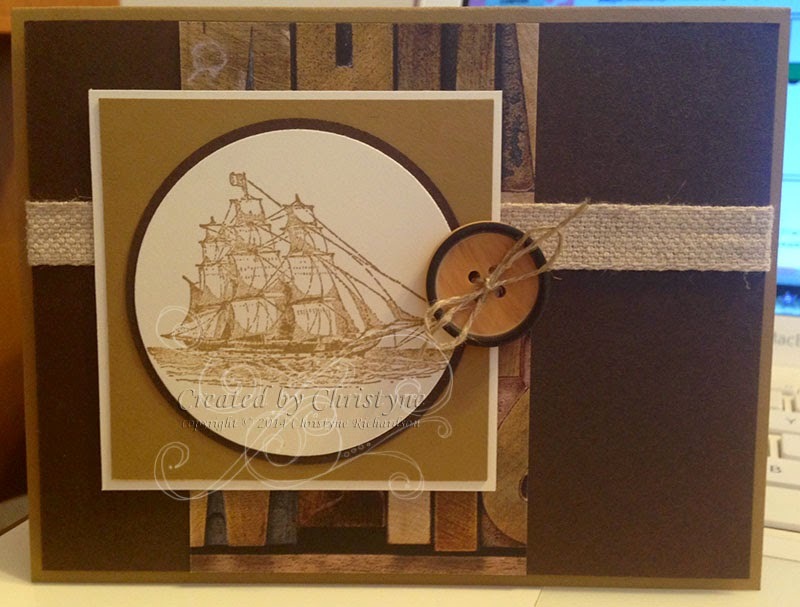 PAPERS: Whisper White, Coastal Cabana, Daffodil Delight and Pacific Point Cardstock; Quatrefancy and In Colours DSP. If my MOJO has come out to play again, I don't want to frighten it. Best to keep it down, I think. Today's card is for MOJO Monday (yes, the current one) and my upcoming manly man card class on May 10th. You'll notice some retiring product on there (it was still available at time of typing). I won't miss the buttons so much (it took me nearly two years to use them! ), but I'm going to miss that ribbon! I think this is roll number 3 or 4. If you're going to miss it too, today is the very last day for FREE shipping on everything, so be sure to submit your order! Use hostess code: 6SDWJQYW for a chance to win some freebies! I started off with a Baked Brown Sugar base and added a layer of Early Espresso Cardstock. The Designer Series Paper is from Soho Subway (also retiring!). My image is from the Open Sea (not retiring!) and is stamped in Baked Brown Sugar on Very Vanilla. I discovered that one of the Circle Framelits is *just* the right size to fit inside the 2 ½" circle punch, making a perfect mat. I was sad to learn that Oh, Hello was retiring. It wasn't originally one of my favourite sets, but I've grown to love it and will be sad to see it go. :( Of course, I'm excited about all the new stuff on the horizon and can't wait to share some of THAT with you! 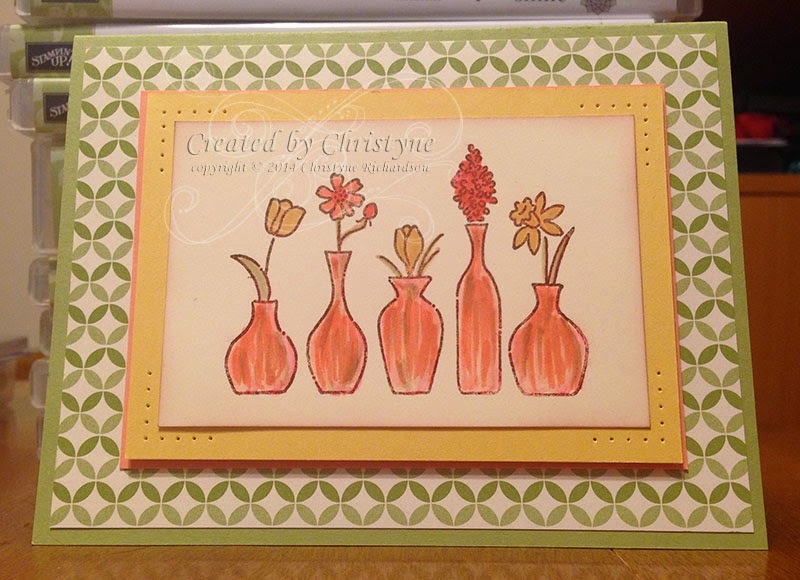 So, I started off with a So Saffron base and added a layer of Afternoon Picnic Designer Series Paper and then a strip of I am Me Designer Series Paper. These are still available at time of typing, but you better hurry and get your last minute orders in! Both accessories AND stamps are only available while supplies last and at least TWO DOZEN items are no longer available from the list that JUST came out on Monday! Free shipping applies till Friday, just be sure to use Hostess Code: 6SDWJQYW when placing your order to qualify to win FREE product! The arrow and camera were stamped and cut out from the Peachy Keen Stamp set - one of my favourites from the Occasions Catalogue. What's your motivation? What keeps you going when you just don't feel like doing something you know you SHOULD be doing? We're told (as direct sellers) that the motivation for what we're doing should be SO big that even if we feel like "phoning it in", we won't. For a while, I had that down. My motivation. It was huge and I wanted it...until I didn't. Maybe it's the long winter, maybe my motivation isn't what I thought it was. Maybe I'm just in a rut. Who knows. But, I'm going to fake it till I make it and internalize some "happy place" thoughts till I get this thing back on track. It's not that I don't like stamping, I do. Something happened and it started feeling like "work". If I could pinpoint what happened, I'd go back to that time and undo it. Since that's not possible, I'll just carry on and see where it takes me. I still very much enjoy stamping...I just need to figure out how to make it NOT feel like work. So...to that end, I'm sharing a card I ENJOYED making today! It's for the Utah Divas Colour Challenge and it just screams spring! I was trying to get a terra cotta look on the vases. Do you think I succeeded? I did all the colouring with my blender pens and ink squished into the ink pad lid. If you haven't seen the technique, you should come to one of my classes as we use it fairly often. I thought this card would make a good "get well soon" card, so I stamped "better get better" from A Dozen Thoughts (which, thank goodness, is NOT retiring - PHEW!). Not me!! The Stampin' UP! retired list! Just go ahead and click the image above to be taken straight to my online store to place your order! Be sure to use hostess code: 6SDWJQYW to be eligible to win FREE product! If enough orders are placed, SOMEONE will receive a FREE BIG SHOT!! To take advantage of the FREE SHIPPING, your order MUST be placed by 11:59 pm EDT on Friday April 25th, 2014.